Every two weeks the city services pick up boxes full of old paper and cardboard in our street. Each household collects a box or two, full of old papers, packaging boxes, magazines, old postcards and tickets. I became more aware of the old paper in my home, when I went to print an invitation card at a copyshop in our neighborhood. I had to pay almost 5 euro's for one sheet of 200 gram's A4 with a full-colour print on only one side! That is really a costly business. 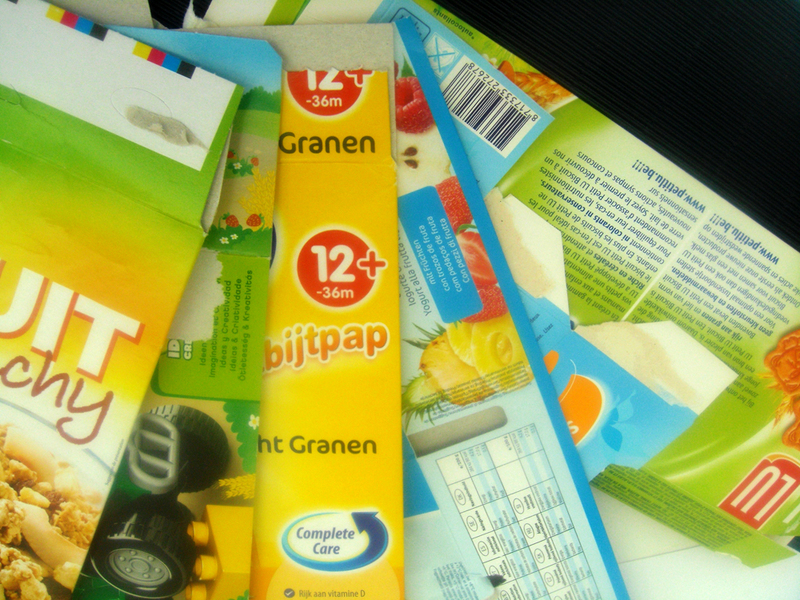 I thought that printing my own designs would make me poor, and I started to think how I could overcome this... Next time I dumped a cereal box in the bin, I noticed what a brilliant colours were printed on this box, and how thick this cardboard actually was. I could use this cardboard to create some special postcards. Eureka! 1. The first step was to collect a couple of discarded boxes, some old christmas cards, two perfume boxes with nice colours and even some with golden prints. 2. 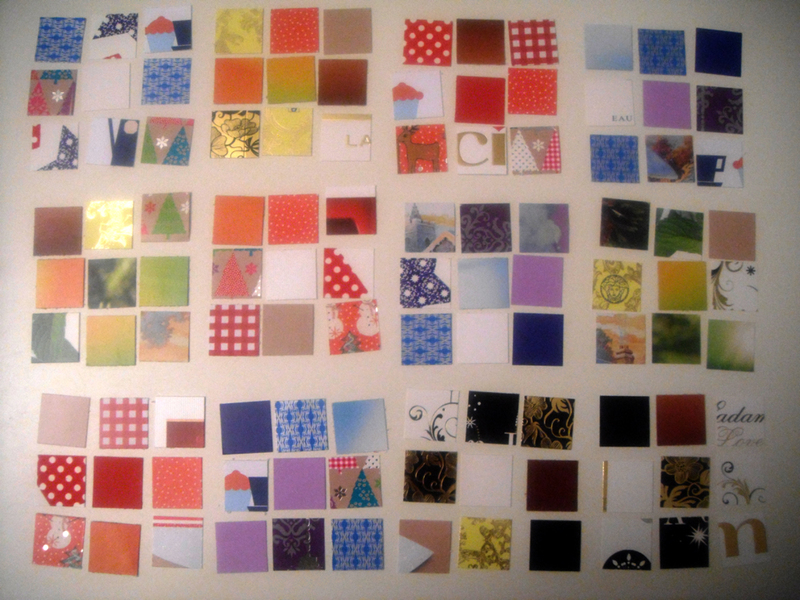 I cut out the nicest pieces of cardboard in squares of 3 x 3 cm. 3. When I had a big pile of squares, I started to combine the squares in mosaics of 3 x 3 matrixes, using colours that were quite similar. 4. 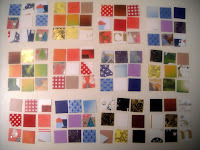 I created 12 postcards by applying each mosaic to a blue folded postcard of 10,5 x 14,8 cm. I used adhesive foam (for 3D cards) to lift up the squares a bit from the card. 5. This is really fun to do, especially making the mosaics just right and sending the postcards to my friends and family, who like to get those at their birthday! Perhaps a good idea for your easter weekend? These cards are also available in my Etsy shop, as a ready made set, or as a DIY kit.